Some interesting insights on our coffee habits show that we drink a staggering 2.2 billion cups of coffee a year, with 80% of consumers visiting a coffee shop regularly and the average commuter consuming over 1,759 coffees3. And it’s what the majority of us like to drink at the first meal of the day, with 57% of coffee drunk at breakfast – followed by 34% between meals and 13% at other meals. Simon Baggaley, Category Manager for NESCAFÉ Coffee Machines, talks briefly about the opportunity for coffee to go. View the full length video here on our YouTube channel. The coffee to go sector has been driven largely by the increase in the transient nature of our lifestyles. Fewer people have breakfast at home and working patterns have become more flexible. In fact, 52% of coffee sales are on the go, generating £1.6bn revenue4. 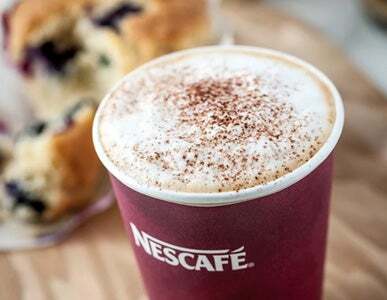 While the coffee shop market is dominated by a small number of big high-street coffee chains, which account for 50% of the branded chain market, convenience stores are well placed to tap into this lucrative market with coffee vending machines such as NESCAFÉ® &GO®. By their very nature, they’re convenient – and a study by Allegra Project Café 2017 placed convenience as the number one driver, with 28% citing as main reason of choice5. No surprise then that the non-specialist sector, which includes pubs, fast food outlets, supermarkets and retail stores, are up 6% in the last year and gourmet vending is growing +14% YOY6. Yet strangely, just 1 in 4 convenience stores have a coffee to go offering7. The potential profit of installing an entry-level coffee vending machine is £10,950 a year9. That’s selling 20 cups a day at the Nestlé RRP of £1.50 per cup. And that’s all for an investment of just £99*. You can achieve payback in less then 2 weeks and what’s more, by installing our coffee vending machine, you’ll be tapping into the UK’s favourite coffee brand10. 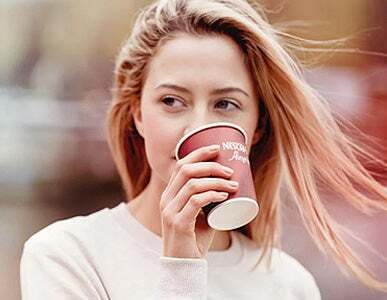 You’ll also be joining over 15,000 retailers in the UK who have already benefited from a NESCAFÉ Coffee To Go drinks machine. (1) & (2) IGD, 2015; (3) Lexham, 2015; (4) Allegra Coffee Report, 2015; (5) & (6) Allegra Project Café, 2017; (7) Research conducted on behalf of Nestlé Professional, 2016; (8) Nestlé’s RRP is £1.50 per cup. RRP is Nestlé’s recommendation only, resale prices are at the sole discretion of the retailer. The estimated turnover calculation is based on selling, at RRP, 20 cups per day, 365 days a year, at an estimated cost of 72p per cup including sundries and VAT. All examples are for illustration purposes only. Nestlé cannot and does not guarantee customer turnover, margins or profit; (9) See footnote 8; (10) IRI MAT 52 weeks March 2017.